Kawasaki Z1000 - Mental metal! 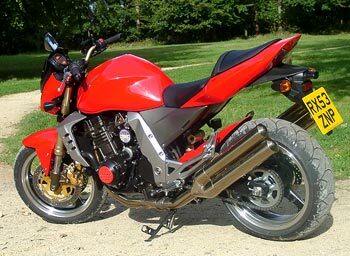 If there's ever a bike that says 'Hooligan' or impractical then this is it! The Z1000 is basically an engine and two wheels with a straight forward and simple steel cradle frame holding it all together. Open the throttle and the front wheel flys skyward, suddenly you're a teenager again! Kawasaki worked long into the night when they designed this bike, and they have come up with a true hybrid. Take the buzz of the ZX6R and stick it into a 1000, then stand back and say "Na, that’s too refined, this bike’s got to be an animal, give it some real bite". So off they went for a tour in downtown Tokyo at night to get ideas from the world of strange clothes, heavily modified cars and juvenile antics. 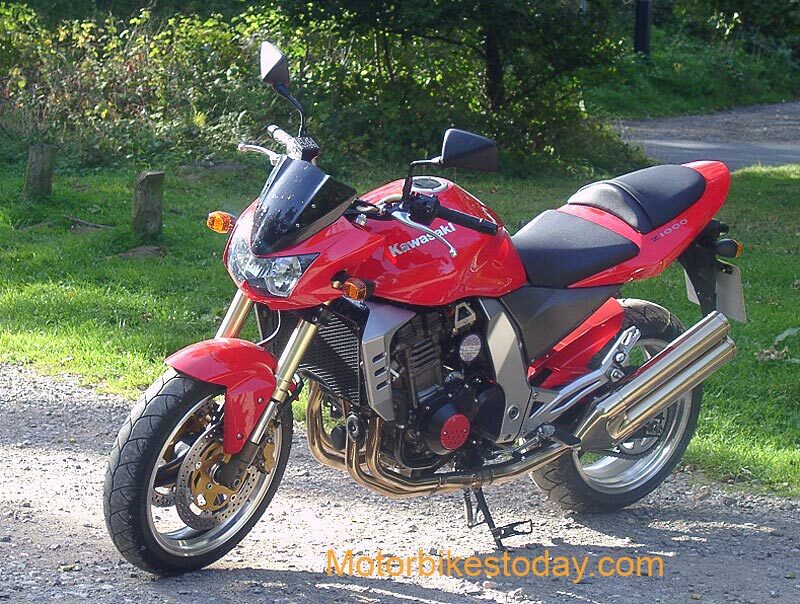 The Z1000 does lack refinement in the engine department, but this strangely gives it an edge and a real character. When the engine is idling the inline four sounds a little rough, but not in an annoying way. The exhaust note is deep and rumbing, and it sounds absolutely ready to just go. The four gold stainless steel pipes just sing their song, it's not opera it's Slipknot - refined streetfighter? Never! The 953cc engine in the Z1000 puts out 120bhp @ 10,200 RPM, and has a solid 66.81 lb-ft of torque. Add to the recipe a light front end and it just makes you laugh when you ride it. Kawasaki say that the bike has been “retuned for midrange”, so naturally you think it has been made tame, but put that thought way out of your head. 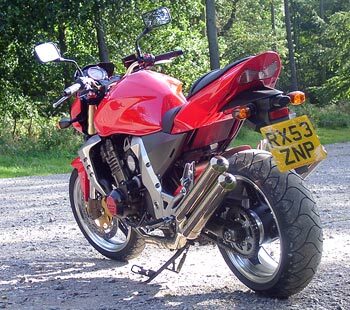 The donor engine came from the old ZX9R, and has been bored out by 2.2 mm resulting in bigger displacement, more low-RPM torque, and only a slight power loss of 4bhp from the original ZX9 lump. But in all this Kawasaki seem to have made the Z1000 motor a hoot to ride, it buzzes like no other litre bike I have ridden. No middle age spread here, no sit back and cruise, it's a sub-compact sized bike with a wheelbase of just 1420mm and a sharp steering rake of 24deg. Nimble and pretty sure footed, and with those gold anodised bars to tug on tight turns become a thing of the past. The seating position is slightly forward, an agressive lean into the bike so your weight isn’t resting on your wrists all the time. This makes it fairly comfortable in most circumstances, and with that small wind cover over the front faster riding on open roads and motorways isn't a problem. Get going and you'll soon find out that the Z1000 doesn't have much to say below 3500 RPM, so give it some more and wake it up, and you! Not that you’ll need any encouragement to do this, as I said earlier it turns you into a teenager and there lies the problem. Get the engine up past the 3500rpm mark and you have a lot of power and torque 'on tap', but be prepared to have a bit of vibration through bars, pegs and seat, it's a bit on the annoying side but livable with most of the time. What turned out to be more annoying was a rattle from somewhere I just couldn't find, it took me over a week to eventually find out that the clutch lever rattled from around 5000rpm up to about 6000 RPM. All it would take to correct this would be a bit of shimming in the lever to stop the slightly excessive play. The reason for most of this vibration is the fact that the engine is a stressed member of the frame, as a result you get some vibration at certain revs and at some stages even the mirrors get the shakes making whatever is behind you even less easy to see. Not that you can actually see that much behind you from the little short armed mirrors, at best it's about a third behind and the rest is your arms! In defence of this the rear view is not your main concern. The amount of power and the way the Z1000 delivers it is enough to make you worry about what's in front. 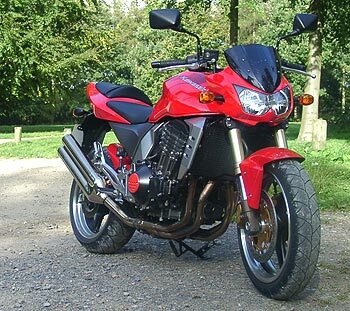 Getting the 120 or so bhp down is what the Z1000 is good at. It has fantastic pulling power up to 11,000rpm or so, and the gearbox ratios are just right. The gearchange is positive although it does require a bit of a firm foot sometimes. It does not need to be revved to the max in every gear, it's not a 600 as you may think from the size. Ride it on the torque and run a gear higher than you think and then it shows it's true character, a little raw but perfectly suited to the bikes style and image. 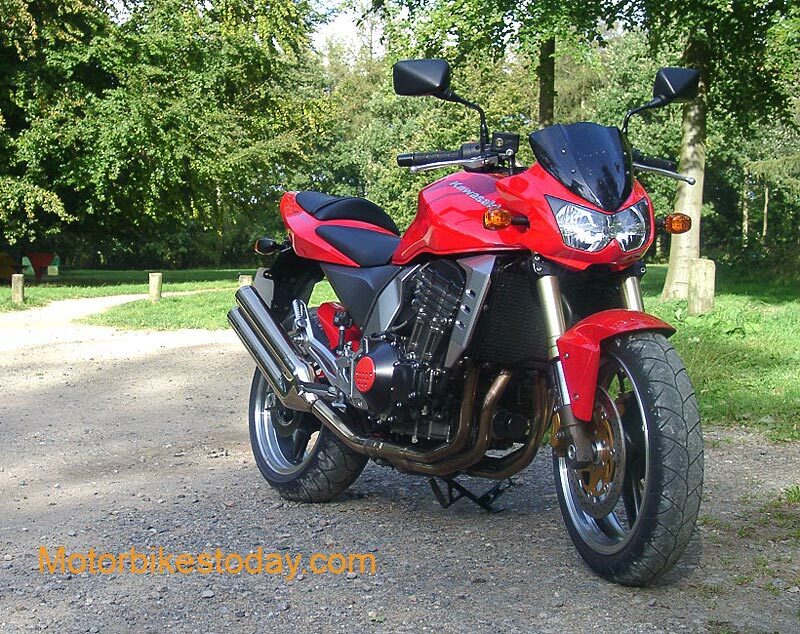 Riding the Z1000 is brilliant, it handles well, is very agile through the corners, and is perfectly at home in traffic and does actually make quite a good commuter as I found out! The chassis layout and design is not up to superbike standard but there's no real flex or movement in the corners at all. The suspension is a little soft at the front in standard trim, but a little adjustment here and there will make a huge difference to that. I did make one or two changes to the damping and pre-load and was much happier after. Gone was the wallowing on long undulating corners, now it was as I had hoped, direct and positive all the way around. Hauling you down from speed are a couple of 300mm semi-floating discs with 4 piston calipers; they do their job well but lack a bit of initial bite to them. Back at the rear is a single caliper on a single fairly small disc mounted directly to the swingarm. 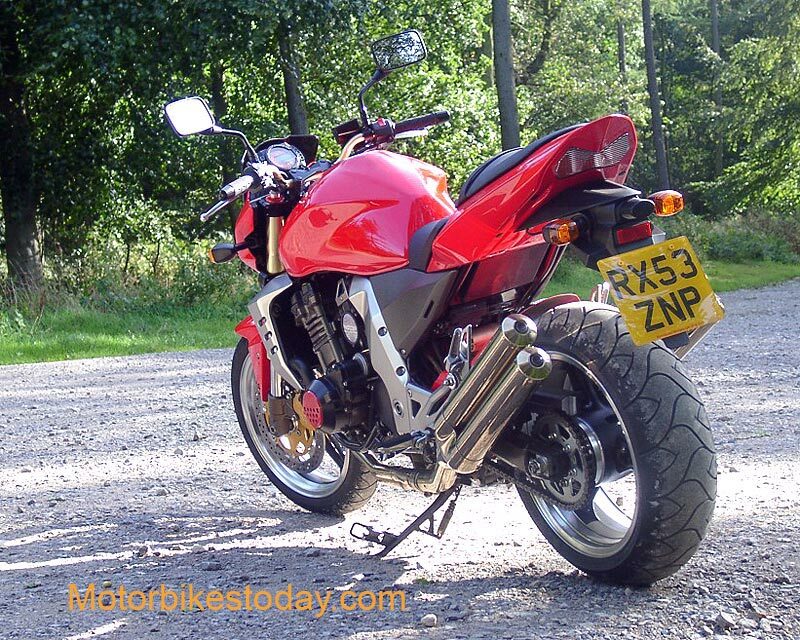 As an everyday bike the Z1000 is mostly at home on the twisties and in town, out on the motorway is not where this bike belongs. A hooligan bike it is, it makes you into one and gives you great muscles at the same time! 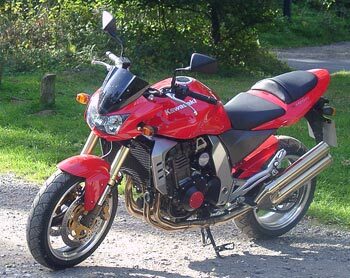 Ride the Z1000 at more than 90mph and you get longer arms, sore neck muscles and a full top half workout, yep hanging on requires good muscles and a good grip! There is a bit of protection from the little 'Turbo' fairing but the main function of this is to house the headlights and create a clean flow of air. The rest of the styling is pure modern streetfighter, all the way back to the LED tailights giving it a totally distinct look compared to the rest of the bikes in its class. Incidentally the guy who designed the Z1000 is the same one who set about creating an icon a few years back, the Mazda MX5. The styling of the Z1000 is pretty unique in the bike world, it's not about saving weight but creating a design that works, even the engine has been designed with extra fins for looks rather than cooling! 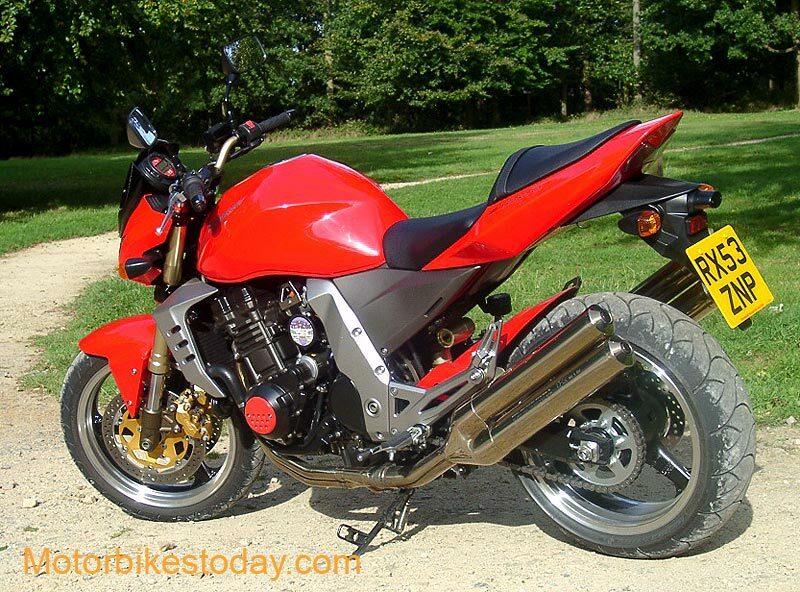 Read external Kawasaki Z1000 reviews on Ciao.